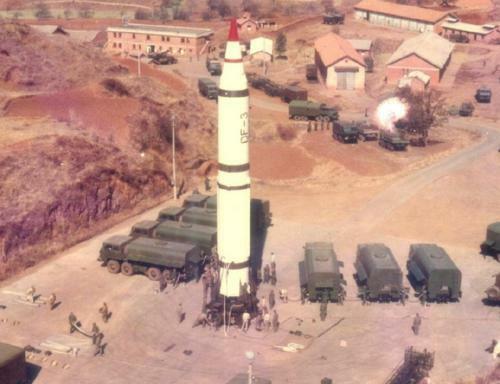 A North Korean Mobile ICBM? This picture shows a Chinese DF-3 missile being fueled for launch after being moved to a launch site. The trucks surrounding it carry the fuel and oxidizer that are pumped into its tanks. This missile is essentially the same size as the first stage of the North Korean Unha-2. Comments by SecDef Robert Gates last summer, and press stories appearing in early December 2011, raised the possibility of a North Korean mobile ICBM. These reports gave the impression that North Korea is leap-frogging its previous efforts at building a long-range missile and is on the verge of posing a new threat to the United States. Given what’s known publicly about North Korea’s missile program, that seemed surprising. I have an analysis that was posted today at 38North.org that shows why. As I explain in that analysis, in developing a long-range missile, the North has a clear motivation to keep that missile from being tied to a fixed launch site. The US and other countries are watching its launch sites carefully, and an ICBM is large and easy to spot. Once the missile is moved into launch position it becomes a target that an adversary could attack during a crisis. So it would not be surprising if North Korea were building or acquiring trucks or trailers that could transport what long-range missile it is currently developing. But that missile will be liquid fueled since North Korea does not have the capability to build large solid-fueled missiles. And a large liquid-fueled missile would have to be transported unfueled. North Korea may therefore be able to make these missiles “moveable,” but not “mobile” in the typical usage of that term. The term “mobile missile” generally connotes a missile carried on a mobile launcher that can move to a desired location, and then raise the missile into launch position and fire it relatively quickly. While an unfueled missile could be moved to a remote launch site, it could not be launched quickly once it reached that site. Instead, the missile body would have to be erected into a vertical position and then filled with fuel from large fuel trucks that accompanied it (see the picture above). This process can take a couple of hours. A pre-emptive strike by an adversary against moveable missiles would be more complicated than such a strike against missiles launched from a known, fixed site. But the additional infrastructure at the site and the launch preparation time would remove some of the advantages typically associated with mobile missiles. As I note in my article, the primary concern for the United States should be stopping the development and flight testing of intermediate- and long-range ballistic missiles, whether or not they are going to eventually be mobile. Currently, North Korea has not successfully flight tested a missile with range longer than 1,300 km. Without flight tests, which are readily detected by U.S. satellites, a delivery system cannot be considered operational. As a result, there would be significant benefits to the US engaging North Korea to reinstate the missile flight moratorium that the North observed from 1998 through 2005—which would keep the Musudan, TD-2, and other missiles from becoming operational—and then to seeking a permanent ban on such tests.